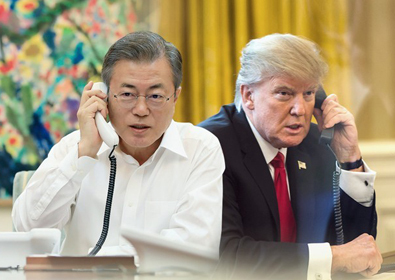 WASHINGTON, Sept. 11 (Yonhap) — U.S. President Donald Trump took out his anger on South Korean President Moon Jae-in as he pummeled the trade and security relationship between the allies, according to a book released Tuesday. Trump and Moon spoke by phone on Jan. 19, one day before the U.S. president marked his first year in office. Not only did Trump dislike Moon, he had an obsession with the US$18 billion trade deficit the U.S. had with South Korea and the $3.5 billion cost of stationing 28,500 troops in the allied nation, Woodward wrote. Trump’s then national security adviser, H.R. McMaster, called a meeting of the National Security Council the same day to discuss issues related to South Korea. It involved the president and key officials, including then Secretary of State Rex Tillerson, Secretary of Defense Jim Mattis and Joint Chiefs of Staff Chairman Joe Dunford. At the meeting, Trump demanded to know what the U.S. got in return for keeping troops in South Korea. He went further to say, “We’re doing this in order to prevent World War III,” casting a silence over the room. Apparently unconvinced, Trump left the meeting. But his principals were exasperated, Woodward wrote. “Mattis was particularly exasperated and alarmed, telling close associates that the president acted like — and had the understanding of — ‘a fifth or sixth grader,’” the author said.